I heard the term A/R ratio today while watching a video about turbochargers. What does the term A/R ratio mean? Does it just apply to turbos? If not, what else does it apply to? The cross-sectional Area to Radius ratio is a consequence of our desire to turn linear energy (the exhaust gasses coming out of the manifold) into radial energy (we need to spin those little wheels). We need something that strongly resembles a funnel that has been stretched and twisted into a spiral. For example, look at the exhaust inlet: this is a relatively large fitting that accepts all of the exhaust gasses. As the piping spirals into where the turbine wheel waits, the radius of each turn decreases. In order to preserve smooth flow, the cross-sectional area of that piping also decreases at a rate proportional to the decrease in area. The result is a constant A/R ratio. Any radial flow blower, compressor, turbine or pump is likely to show a similar shape and, therefore, will also have a constant A/R ratio. This is where things get fun: I get to be Mr. Wizard and we can do science. The thinnest stirring straw that you can still blow through. A section of garden hose that you're willing to put your lips on. First, blow through the stirrer. Feel the airflow out the other end. It feels like a laser beam of air pressure, right? You can focus it right on target, blowing small things around like grains of salt like crazy. Now try the drinking straw. This doesn't feel as laser-like. You can still blow salt around but it's not as focused. Try blowing as hard as you can. Great big poofs of salt flying around without difficulty, right? Now try the stirrer again. Blow as hard as you can. Notice how the energy coming out seems to peak early even though your eyes are about to pop out of your head? Now try the garden hose. This is boring, right? It feels like nothing special is coming out the other end. You can blow super hard without difficulty but also without any great rewards. Get that turbine wheel moving as soon as possible (we want boost at low revs). The small area stirrer illustrates this: it's easy to puff through that almost without effort. Keep spinning that turbine as exhaust gas energy increases. The stirrer shows that a small area runs out of puff quickly. The larger area straw does better. Avoid restricting the gas flow, acting as an exhaust bottleneck and restricting overall power. The garden hose is barely any restriction at all. The stirrer made your eyeballs pop out. As a general rule of thumb, a small A/R ratio is used to optimize low lag, low end boost while sacrificing high end boost. These are common on street cars today. A larger A/R ratio is used to optimize for peak, high end boost and is great for use at the track. The A/R ratio is the ratio of the cross-sectional area of the area where gasses flow and the radius of that spot from the center of the turbocharger. Usually the A/R ratio is constant along the channels where gasses flow. The letters A/R refer to Area and Radius. 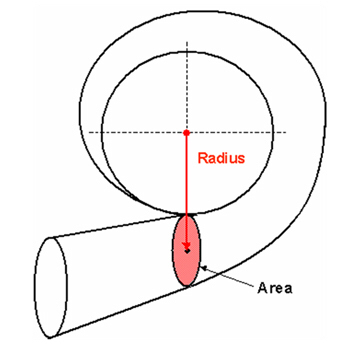 If the radius of the turbocharger is greater at a given point, the cross-sectional area of that spot should be larger, to maintain a constant A/R ratio. Conversely, if the radius of the turbocharger is smaller at a given point, the cross-sectional area at that point should be smaller, to maintain a constant A/R ratio. Smaller A/R ratios optimize the turbocharger for quick response, but it reduces high RPM power. Larger A/R ratios have more boost at high RPM, but they have more "turbo lag" (delay in boost). 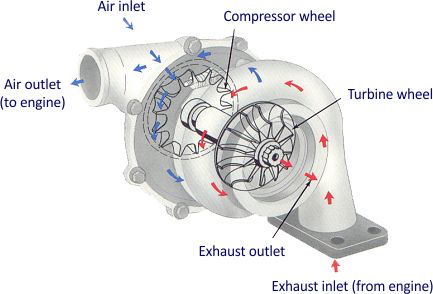 Turbochargers have two A/R ratios, one for the turbine side (exhaust side), and one for the impeller side (intake side). If the intent of the turbocharger is to provide additional efficiency, or more low end torque, then a lower A/R ratio is preferred. The engine will be very responsive to throttle changes, with little perceptible lag. If the intent of the turbocharger is to provide maximum power for racing, then a high A/R ratio is preferred. It will present less back pressure to the exhaust side, and it will provide more boost without excessive turbine RPM. There will, however, be a more noticeable lag. Not the answer you're looking for? Browse other questions tagged engine-theory turbocharger or ask your own question. What is the Lovell Factor? Why does a gas engines torque and horsepower curve always meet at 5252 RPM? What mechanical revolution is measured in “RPM”? Why choose either recirculated or dump to atmo blow off valve? How to calculate the compression height of a piston?